CAGE-LESS, OVERNIGHT DOG BOARDING SERVICES ARE OFFERED 7 NIGHTS A WEEK! Bring your dog to stay while you're away! Rest assured that your pup will have just as much fun boarding at Barx Parx as you will on your well-deserved vacation. 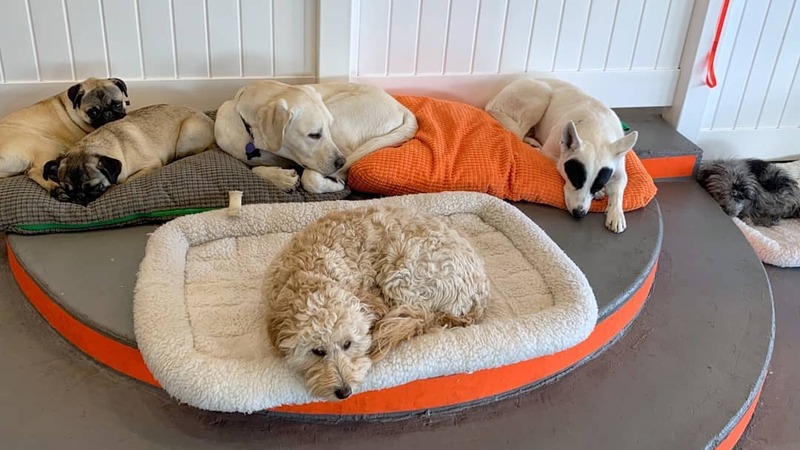 We'll do everything we can to ensure your dog is happy and healthy during their overnight stay and you can feel confident knowing your dog will be well-cared for during their sleepover in our safe and secure environment. WHAT IS CAGE-LESS BOARDING? IT'S A SUPER LOW STRESS, FUN SLEEPOVER! All of our boarding guests will sleep on comfy cots and beds in the play park with other friends. The lights will be dimmed and soothing, relaxing music will be played as pups fall asleep next to one of our supervising park rangers. Unless otherwise specified by the owner, no kennels will be used during boarding with exception of feeding time and behavior-induced time outs. Cage-less, overnight dog boarding starts at $53.95* and is offered 7 days a week, including holidays. This rate is for an up to 24-hour* period. Anything past that will be charged an additional fee of either a half day rate or full day rate of daycare. Discounts for multiple dogs are also available. *We also offer a special 12-hour period overnight boarding option for ONLY $33.95. Contact us for more details! Cancellations with less than 48 hours of advance notice will be charged 50% of boarding fees. Boarded dogs may be dropped off or picked up between the hours of 7am and 9am, and between 4pm and 6pm. In order to play in the park, board or use the daycare facilities, owners must register their dogs and provide proof of their spay/neuter and of current vaccinations in addition to passing a pre-scheduled behavior assessment. Owners must also go over the park rules and regulations and agree to our terms before using the facility. Additional discounts available for Standard and Plus Members. Please note that all prices are subject to change at any time without notice.